In this issue of IMPACT Magazine, we speak with Atlanta, GA based company Yummy Spoonfuls CEO, Agatha Achindu! Agatha is from Africa and has grown up on home cooked meals; on a daily basis. After having her son, Agatha saw the need for organic baby food! She had already been preparing 300 meals a week for friends, family, and businesses. 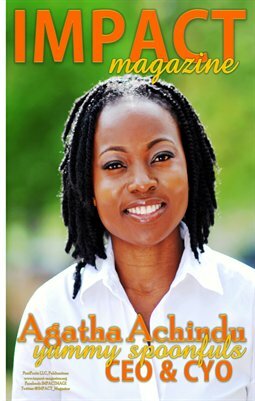 Agatha took a leap of faith because she knew that food is medicine! Just from her own upbringing, Agatha knew our children needed to begin their lives healthy and Yummy Spoonfuls does just that! In addition, we educate you on organic food and why it is so pertinent to your grocery food items. Strive for healthiness...I know I am...from the inside...out!